It's an early blog today as I'm off on a management training course for a couple of days. In between practising my catchphrases such as 'we're really skiing off piste here', I've found time to do some important research into how to make hollandaise sauce. I love poached eggs and bacon and if I'm staying somewhere posh that does more than the bog-standard full English for breakfast, Eggs Benedict is my breakfast of choice. No chance of getting this at the swanky hotel tomorrow as the course kicks off again at ridiculous-o'clock so it'll be a lovely room service pastry basket for me! 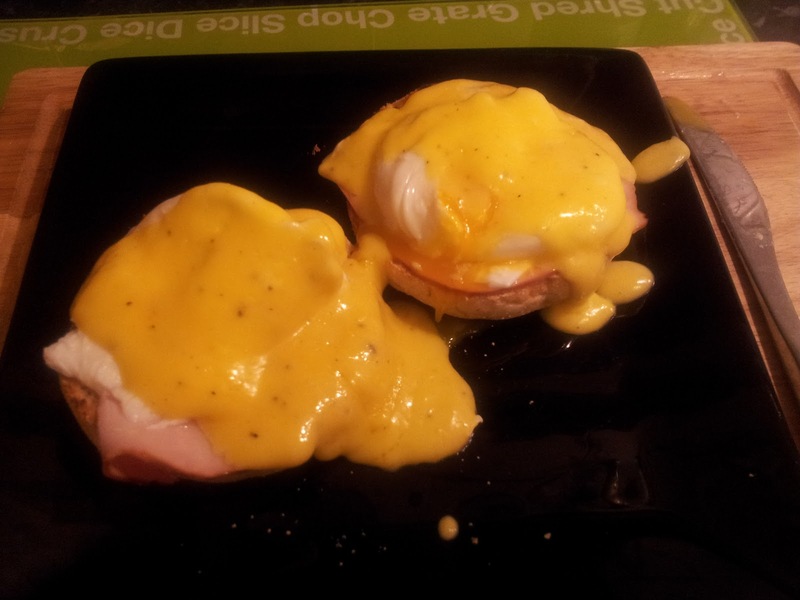 But making hollandaise is one of those cheffy things that they make sound really complicated. Delia, for example, advocates using a food processor but the husband would kill me if I turned mine on before midday so I had to find a recipe to do it 'the hard way'. In fact, it all sounds pretty simple aside from the risk of it splitting. The present tense is because I'm quickly typing this blog before I make an attempt on this recipe so it may all go horribly wrong. I settled on a BBC Good Food recipe by Cass Titcombe, partly for the fact it's only supposed to take 10 minutes but also because it uses an even number of egg yolks, so I know it should work if I halve the recipe as I'm only making it for me. As for the perfect poached egg, I have my own method. Being something that I would eat most days in lieu of a proper dinner, I perfected my personal art of egg poaching many years ago. My mother swears that you should poach in a shallow pan and add vinegar to the water, but I hate the weird tang this gives to the eggs. I'm not sure how to describe it, but it just spoils the flavour of the yolk by making the whites taste like they are rancid. Other people use microwave poachers (why?? the eggs go all rubbery like you were at a Little Chef) or poaching pans or the new-fangled poach pods you can buy from Lakeland. Or they faff around breaking the egg into a cup and sliding it into the water. Me? I bring a deep saucepan of lightly salted water to a simmer. I then put the eggs in their shells into the water for 10 seconds which just starts to firm up the white. Scoop the eggs out with a slotted spoon, then use a whisk to create a vortex in the pan. Crack the egg on the side of the pan and pour into the still spinning water. This will ensure the white doesn't spread everywhere - same theory as the vinegar method, it just tastes far nicer and has a much better shape. Keep the water at a simmer for four minutes, remove egg and serve. Faffy? Maybe. But once you've got the knack, it becomes second nature and that long-winded paragraph is like riding a bike. Right. Off to test the recipe - back soon! So yellow, you can't see the egg yolk oozing on the right! Okay, I'm back. In the end, because I couldn't be bothered with the extra washing up that Cass Titcombe creates by melting her butter in a separate pan first (and using the microwave this early carries the same penalty as using the food processor), I opted for James Martin's hollandaise recipe instead - although having no smoked salmon I stuck with the traditional ham. The other bonus was that it used half the butter of Titcombe's recipe. Which surprised me as the lovely James is a huge fan of butter. He must have humungous arteries having seen all the lovely, buttery grub he rustles up on Saturday Kitchen. The sauce was a success. No splitting. Although I can see the benefits of melting the butter first as mine was rock solid and it took ages for it to melt. But I was left with a gloriously sunny sauce which perfectly complemented the rich egg and salty-smoked ham. As always the picture is rubbish. Dingy kitchen, 6.30am, crap camera phone. Please Santa, bring me a lovely new pocket camera!